A mere three months after crossing the Atlantic, Charles Lindbergh was still a hero to the entire nation. It’s easy to figure out from newspapers of the time, such as this News-Bee editorial of August 10, 1927. LINDBERGH! As your engine drones today above the wheat shocks, the orchards and the gardens of Ohio, a state serene and beautiful calls greeting to you. As you mount and skim the clouds, six million people, each in his own vocation, stand by to serve Ohio and America as you do. Theirs is no such epic part as yours. They are earth folk. It is only in spirit that they join you in the sky. Yet each of them has his role in the dramatic today. These are the people that you represent as you achieve to the limit of men’s dreams. Lindbergh! As the opening horizon lays a busy, prospering Toledo at your feet, a city happy and ambitious bids you godspeed. Here dwell 300,000 peaceful people. They, like you, have visions of the future. They are air-minded. They have been stirred by your conquest of the elements. They see in you the symbol of man’s power. Youth, and the daring-do that laughs at danger – these are the qualities Toledo folk adore. Men and women of practical minds live here. They could be no more content than you with idlness and day dreams. You have given them the inspiration, you have renewed their faith in big projects, their hope in gigantic public enterprises. For a few minutes today they glimpse you in the Spirit of St. Louis. Their hearts leap up. They are better for this sight of the argosy of the air. Earnestly they watch you, because you have become the herald of their aspirations. Eagerly they watch, because you send to them a message at once practical and high-minded, with an appeal that they can understand. Lindbergh! As you release the message to the people of Toledo, as it drifts down, a prophetic oriflamme, a city united, gratified and inspired receives it. We shall turn tomorrow to our work. We shall not forget the opportunity in the air that you have brought to our attention. Lindbergh spent a busy time in Indianapolis Tuesday night and Wednesday morning. His destination is Detroit. He will not land in Toledo. At the request of the News-Bee, he will circle the city, fly over the civic center and drop his message to the waiting throngs at Armory Park. 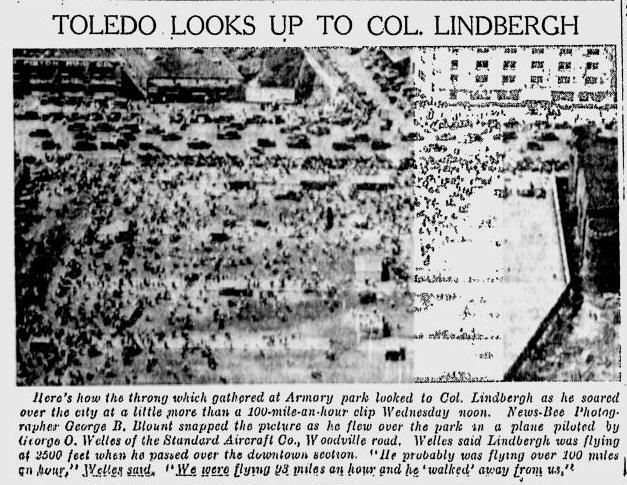 Aerial bombs will be fired on top of the News-Bee building at the news of Lindbergh’s arrival. Later editions of The News-Bee will carry complete accounts of his air visit here. Armory Park was a baseball park, located where the U.S. District Courthouse is now at Spielbusch Avenue. and Orange Street. It was the home of the Mud Hens until they moved to Swayne Field in 1909. Its history is well-documented here. Because of the limited time and the extensive itinerary of the tour of the United States now in progress to encourage popular interest in aeronautics, it is impossible for the Spirit of St. Louis to land in your city. This message from the air, however, is sent you to express our sincere appreciation of your interest in the tour and in the promotion and extension of commercial aeronautics in the United States. We feel that we will be amply repaid for all our efforts if each and every citizen in the United States cherishes an interest in flying and gives his earnest support to the air mail service and the establishment of airports and similar facilities. The concerted efforts of the citizens of the United States in this direction will result in America taking its rightful place, within a very short time, as the world leader in commercial flying. A baby found on a doorstep of an Oak Street home was named Charles Lindbergh Doe by nurses at the Maternity and Children’s Hospital on Summit Street. 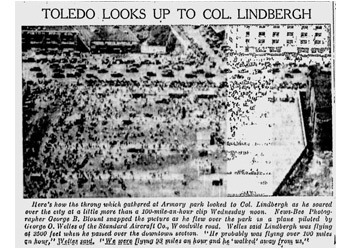 In a 1954 section dedicated to the opening of Toledo Express Airport, The Blade recounted two more Lindbergh stories. The first, on July 1, 1927, was when Lindbergh swooped down and circled the Toledo Trust Co. building at Summit Street and Madison Avenue. Spectators were able to spot the plane’s NX211 insignia, and later it was confirmed that it indeed was Lindbergh, when he landed at Selfridge Field in Mount Clemens, Michigan. Exactly one year later on July 1, 1928, a plane Lindbergh was flying ran out of gas and he was forced to put down in Magee Marsh, near Bono. A group of farmers working nearby offered their help but needed to be convinced that the flyer was indeed who he said he was. is that why there is a neighborhood called “Lindbergh Heights” near by? ?